For years, Internet outbreak has changed the world business entirely, especially how it resulted in the new term: eCommerce. Selling online breaks the barrier of time and space to reach target customers; then use smart tactics to drive them into consumers. To do this task, an eCommerce website is of the essence. Startups with the limited budget, experience, and tech-savvy usually select among available plug-n’-play eCommerce platforms to save effort and resources. Smart Product Filter: Put yourself in customers’ shoes to make search system smooth and exact. One-step Checkout: Checkout is the make-or-break point! The pro tips are to ask less, support automation, and gather all steps in one. Multiple Shipping and Payment Methods: Reduce shipping fee, clearly display all cost, and offer flexible shipping/payment methods. Mobile-oriented Commerce: Be ready to mobile commerce, to be specific, take mobile responsivity into account. Predictions for SEO: Failure to bring your name to the eyes of customers means in-vain efforts. Here, optimize SEO strategy for user experience, mobile-first index, voice-search, the instant answer in featured content, etc. On the market, dozens of eCommerce platforms are available – both free and paid, which is confusing to choose the successful one. This article gives you a helping hand by presenting an overview of pricing, features, and pros & cons of the current Top 3. By adopting advanced technology while still retaining its open source, Magento makes it possible to customize according to online merchants’ needs and; thus; taking market shares of others. Here, I focus on Magento 2 since Magento 1 is somewhat out-of-date. Price: There are 2 main editions to choose from. Magento 2 Open Source is FREE whereas Magento 2 Commerce might cost you the annual license fee around $22,000 and more. Besides the general features mentioned above, the Commerce also supports advanced functions that enhance the business significantly. Break down into Magento 2 features here. Magento 2 is rich-feature and even can be customized and extended for more, not to mention, there is a FREE version. You can find almost all features such as smart product filter, one-step checkout, multiple shipping & payments, mobile commerce, and advanced SEO tools in Magento 2. Online merchants freely use their preferred hosting services, third-party extensions, web design agencies, etc. The load speed of Magento 2 is among the fastest, which is integral to eCommerce business the make the most of UI, UX. Furthermore, Magento community is the sweet home to over 300,000 members including merchants, providers, contributors, etc. worldwide. As a result, its features and security are updated continuously. However, many features usually go with complex initial settings, time and effort to get familiar. Even, some are abundant if your products are simple or your business scale is small. One more thing to note is the Open Source means no extra support. From 5-year experience in this industry, I recommend Magento 2 Open Source to startups while Commerce is suitable for medium to large entrepreneurs. Introduced earlier than Magento 2 in 2006, Shopify is another big name in this 5 leading eCommerce platform list. You might be surprised as there are many famous websites built on Shopify such as Kylie Cosmetics by Kylie Jenner, Los Angeles Lakers, Tesla Motors, Red Bull, etc. 14-day free trial: Try to find out whether Shopify fits your business and get familiar with its features. Basic Shopify: $29/month is a sweet spot for startups wanting to deploy a basic and functional website. Shopify: This most popular solution goes for $79/month – the suitable option for entrepreneurs that plan to scale up quickly. Advanced Shopify: Priced at $299 per month, the Advanced Shopify is ideal for high-revenue companies which make it around $10,000 per month. Shopify Plus: Please contact for pricing request. Usually, Shopify brings it about $2000/month. Note: Additional fees might be charged, based on your selected plan. The higher you pay, the more advanced features you get, but here are several highlights you need to know about Shopify. What makes Shopify the preferred choice of startups is its simplicity of usage and affordable pricing. Also, no need to be a good command of English or technical to run a Shopify website. What’s more, Shopify has an active community available to support 24/7. However, if you want to switch from Shopify to other platforms, it will never a smooth journey, not to mention, the basic features are sometimes not enough to meet the dynamic demands of customers. Shopify also fits the eCommerce upcoming trends very well. For small store owners and startups, the Basic Shopify or Shopify Lite is the suitable choice in budget as well as in features. BigCommerce is the next name on the list, which is loved by its decent and user-friendly interface. BigCommerce offers various plans ranging from $29.95 up to $1,500 per month. BigCommerce Standard: At such a reasonable price of $29.95/month, the features are rather rich: unlimited products and storage, multi-user account, sales channels, responsive website, blog, etc. BigCommerce Plus: Coming at all the Standard’s features, this plan also supports customer segmentation, abandoned cart saver, and stored credit card. BigCommerce Pro: Sure, merchants get all functions of the previous plans and many more. Instead, BigCommerce charges you $249.95/month. This is ideal if your business is scaling up. BigCommerce Enterprise: For the full services, please send a request for custom pricing. I really like the smart product filter of this plan. If your annual revenue is over $125,000, you might also try the Enterprise. 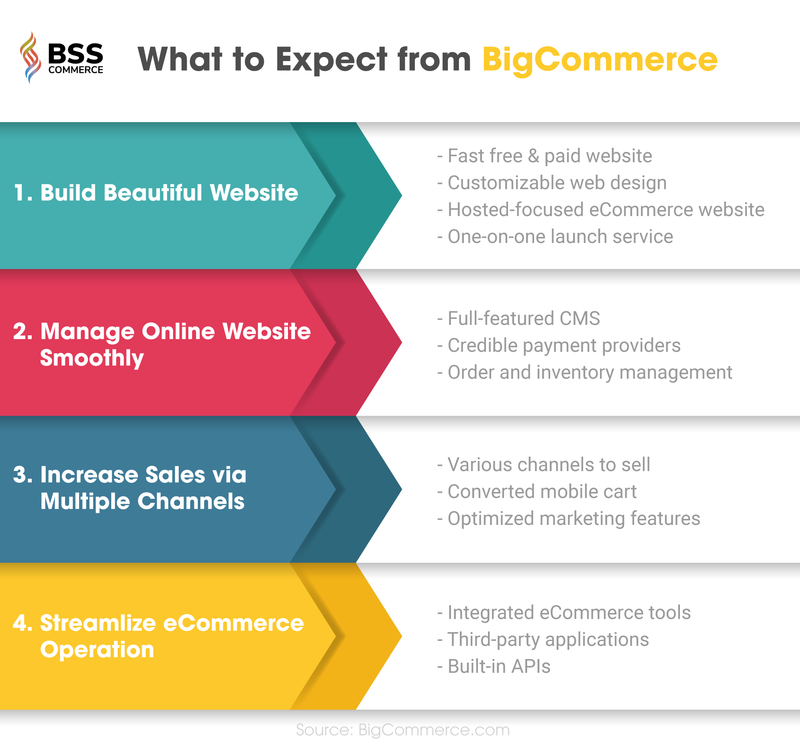 Overall, BigCommerce has the advantages of the beautiful and responsive themes, user-friendly usage, advanced SEO functionalities, over-60-integrated payment gateway, etc. Nevertheless, the pricing is a bit tough in comparison with Magento 2 or Shopify with similar features. Besides, the availability of add-ons is lack. Above is the brief overview of the three most popular eCommerce platforms in 2019 and ever beyond: Magento 2 vs. Shopify vs. BigCommerce. Whichever is your final choice, please keep in mind that it should fit your products first, and then your budget. I wish your business every success. Having spent 5 years on eCommerce industry, Julie describes herself as an expat at heart and believes it’s important to connect, share and help store owners to be successful with suitable eCommerce solutions. Meet Julie at BSS Commerce.